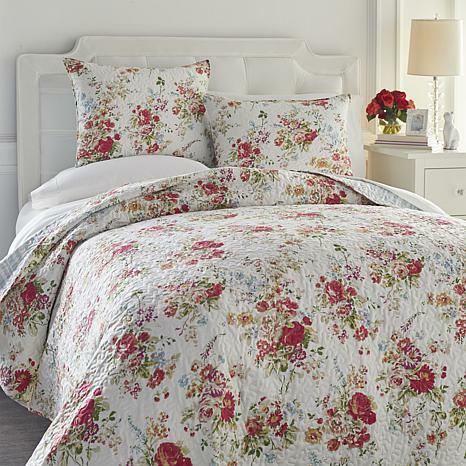 Create the look of a chic country garden with this shabby chic floral quilt set. Traditional vermicelli stitching adds a lovely texture, while the brushed microfiber fabrication adds lightweight softness that is comfortable to use all year round. 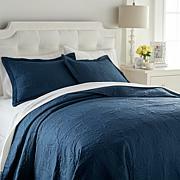 The shams and coverlet reverse to an attractive sky blue striped pattern for a clean and classic look. Beautiful - Great Quality ! Ordered King for my masterbedroom in Maine- it is so pretty and will fit the decor of this 1900 cottage. Went back and ordered another King - will put floral side up and fold the stripe side on end of bed. 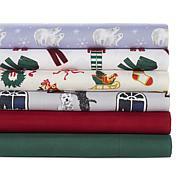 Also will have 4 shams-can put 2 on floral side and 2 on stripe side. Colors are striking and quality is superb ! The stripe is prettier than picture- it is dotted. This is my 1st review of a product & its a full 5 Star! I needed a bright change in my bedroom and love floral prints and the color pink. Well this quilt not only transformed my cozy little Manhattan apt bedroom but it literally instantly brightened up my room. So girlie and pretty. Didnt know what to expect quality wise and Im very pleased. FYI, I did go with king size as I have 7 bed risers on a full size bed. Perfection! 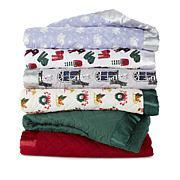 This Quilt is perfect in every way, quality, pattern, a must have for any time of the year. The colors are beautiful not too bright and the thickness is perfect for the summer and can be used over a thicker blanket in the winter. Very pleased!! Fit just perfect and is soft after washed very important to me. Your Bedroom Will Transform Into Christmas! I couldn't wait! Upon receipt, I opened the packaging and dressed up my bed with this beautiful, quaint, Cottage Collection Floral 3-piece Quilt Set. My bed was transformed immediately to yesteryear, I thought I was back to my Grandma and Grandpa's home. Now I'm the Grandma! I can't wait for my grandchildren to see our home all decorated, but this year HSN has added an extra air of excitement! Thank you, HSN! 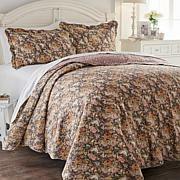 HSN's exclusive Cottage Collection features bedding with a warm, casual look that blends the quaint with the modern. Express your personal style with soft palettes and vintage-inspired designs for a touch of cottage charm. It's comforting. It's inviting. It's love at first sleep.